Medcell Alkaline Battery - G .
The OneTouch Logbook for use with your blood glucose meter will help you track and retain blood glucose results. Writing test results in a logbook and comparing them over time can show you and your health care professional if your diabetes management program is working for you, or if you need to make adjustments. Keeping your logbook up to date is also a great way to see how daily events like meals and exercise impact your blood glucose. This is a very valuable booklet. Easy To Use. Compact. Accurate. Painless. Daily Use. Travel. Adults. Everyday. I find the book easy to use. It is compact and easy to pack for traveling. I like the way it's so easy to order online and receive so quickly. by raybo from griffin ga.
After running out of space in my log book, i could not find extra log books at pharmacies. i did not want to download copies from the computer because of the size of paper. Thank goodness i found the log books on your medical supply site. Now i can go back to tracking my numbers as part of my diabetes routine. Easy To Use. Compact. Accurate. Reliable. Daily Use. Travel. Everyday. Adults. Love the One Touch logbook! 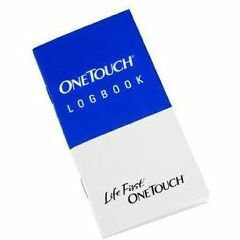 I need onetouch logbook,how can i obtain it? I shopped around online and ordered four from allegromedical.com, to keep shipping costs down. Ordered from Allegro Medical. I really like the setup. (Can get similar format online, one page at a time, but much larger.) I like the small book to slip into my carrrying case.